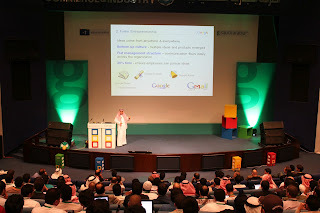 After its roaring success in South America, Middle East and Africa, we’re delighted to bring Google g|days to India. The g|day events are an opportunity for businesses and web developers to learn more about Google products and the opportunities that are available online. Google products have always been simple and easy to use, and with g|india events, we hope to make our platform and tools more accessible to the Business and Developer communities in India. We will be hosting 5 events in India from July to September, with the kickoff in Chennai on the 19/20th of July, and cover all major cities like Bangalore, Hyderabad, Delhi with the final event in Mumbai on the 13 / 14 September 2012. The two day event will cater to different audiences with Day 1 focussing on businesses who want to learn more about Google products and Day 2 will be dedicated to the tech audience like webmasters & App developers. Day 1: Business Day: Business users and entrepreneurs will benefit from learning about Google tools that will help them to improve and take advantage of their online presence. We will host dedicated tracks on topics likes AdWords, AdSense, YouTube, Google+, and Google Apps. Day 2: Technical Day: Will provide an opportunity to web developers and webmasters to discuss and learn more about Google platforms like Android, Google+, Google Apps and Google APIs. The events will feature multiple tracks, including sessions specifically for Women Entrepreneurs and sessions for people seeking to become more involved with Google. We will also host multiple panel discussions on both days giving the audience a chance to hear from Google product leads and local industry experts. The event is totally free, with registrations opening today. So hurry up and make sure to register yourself today. The countdown to the g|india events has begun, and so has the excitement. Posted by Sunil Rao, Country Head , Outreach Programs, India.